In Michael Jones McKean’s exhibition The Ground, organized by the Contemporary, he explores the many lives of a former department store that is now home to a sea of internet servers. BALTIMORE — In his current exhibition The Ground, Michael Jones McKean unfurls the passage of time like the reveal of an exquisite corpse drawing, unearthing multiple timelines to let them reunite in the present. The project is produced by the Contemporary, a nomadic museum in Baltimore whose temporary installations inhabit different pockets and neighborhoods across the city. The Ground is sited downtown in the historic Hutzler Brothers Palace Building, a late 19th-century retail department store (or “museum of merchandise,” per early advertisements) now closed to the public and home to a sea of internet servers. McKean coalesces the many lives of his chosen venue and collapses our sense of time and history. 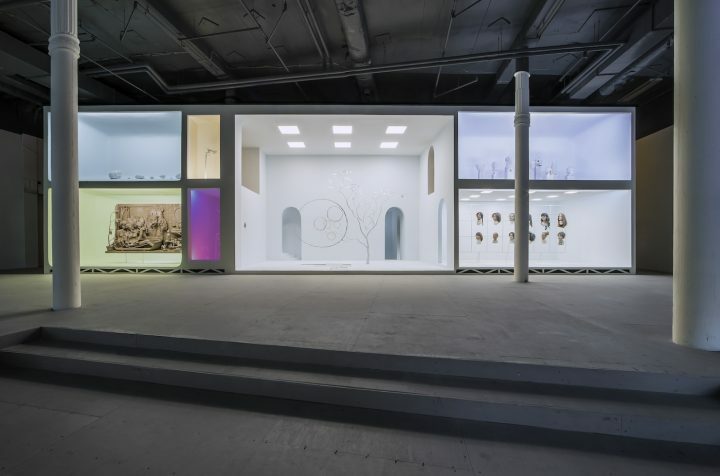 In a sprawling and cavernous chamber, McKean has constructed a building of his own: a stark white, two-sided, multistory one, segmented into a grid of alcoves. Each bay houses a sculptural vignette that evokes histories of ethnography and anthropology both real and imagined. 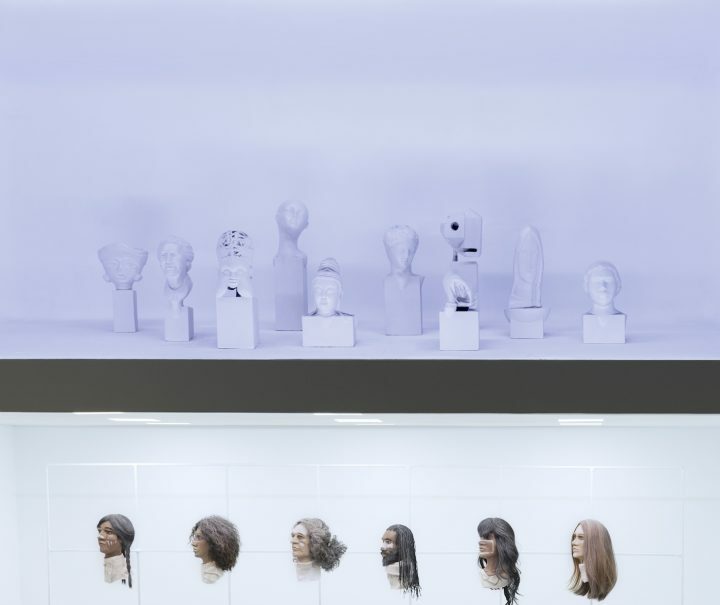 In one pair of recesses, rows of human heads, their faces symbolically marked, resemble specimens ripe for some variation of humanistic study; overhead, canonical busts rest atop shallow plinths. Across this stack of two nooks, McKean references the evolution of naturalism in art to challenge artificial hierarchies between antiquity and novelty. Even more interestingly, he carefully underlines the ways in which time reduces historical figures to mere icons. Circling to the reverse of McKean’s towering edifice, one finds a small grotto of shrubbery, arched doorways like dormant portals, and casts of quotidian objects with varying formal overlaps (e.g. the teeth of a chainsaw mirroring the spines of a horseshoe crab, the handheld tactility of both an avocado and a MacBook mouse). Taken as a whole, this architectonic tableau feels a bit like the bedroom interior in the ending of the film 2001: A Space Odyssey. The materials invoke a familiar human landscape, yet come together to create something peculiar, alien. This is a time that we recognize, but cannot situate — a timelessness culled from passing histories and our own reality. One sculpture, a discreet but undeniable standout of the show, portrays a modern-day nativity set in a cramped bathroom; a shower curtain, tub, and mother’s womb cut away to reveal a newborn at the very moment it emerges into the world. Groups of figures testify to this event, including a cluster of nine crouched women who recede slightly into the background, a set of haloed deities, and a watchful feline perched on a nearby stool. Some sport fashionably coiffed hair, others harkening to mid-century style, while the adjacent saintly bystanders allude to the origins of religious lore. Each character is represented in such a way that together they appear to populate the scene from an array of unique moments in time, deliberately muddying any attempts at historicity. And yet the figure of the newborn, taking in its first breath of life, is resolutely timeless. Though the baby is still joined to its mother by an umbilical cord, McKean mirrors this idea of connectedness through a second serpentine cord that floats above the many figures, creating echoes of motherhood in ways both ancestral and familial, spiritual and celestial, immediate and eternal. 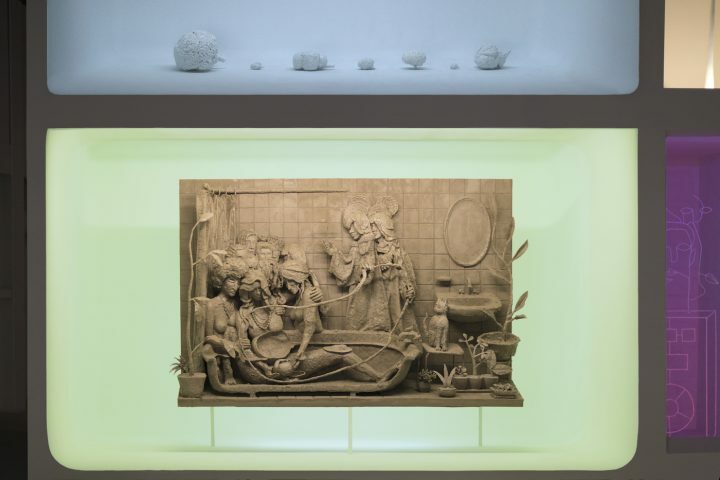 This flattening of coexistent timelines is reinforced by the artist’s use of unfired clay to render the forms and surroundings. Select surfaces of the work fracture like mudcracks, as if bearing witness to thousands of years of sun; others carry indentations of the artist’s fingers—fossils of the sculpture’s creation. What teems with associations to an ancient history is simultaneously imbued with a certain mutability, as if to assert that any past that we as human beings inherit may nevertheless be malleable and manipulated in the present. McKean’s exploration of allegory and skewed storylines resonates strongly with the work of Pierre Huyghe. In a 2012 monograph, art historian Amelia Barikin introduced the titular concept of “parallel presents” to frame the artist’s visual gestures. 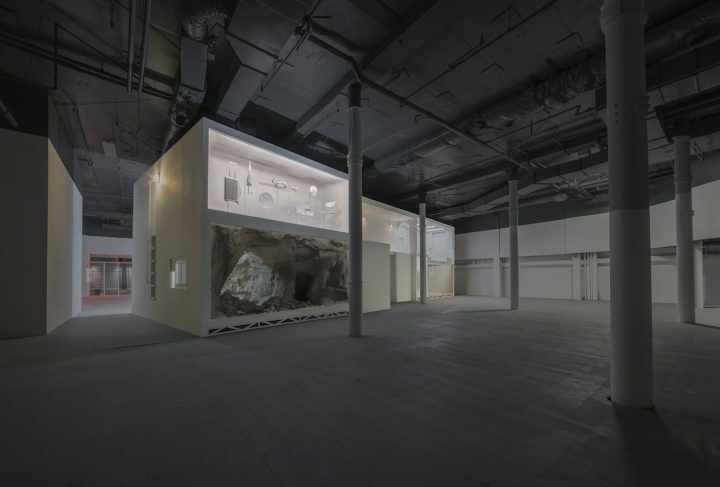 His works, she described, “often superimpose narratives on temporary discrete periods, overlaying myths and histories within particular geographic locations.” In quite a similar vein, McKean accumulates moments from the past to disrupt a stable conception of ‘place.’ However, where Huyghe situates his projects in a language of the present — one very much comparable to the temporal montage of a palimpsest — McKean fans out eons into a single moment, letting the frictions that emerge from this spontaneity linger. In this way, The Ground distills the rapid technosocial acceleration of our relationship with the world. As if a nod to the exhibition’s namesake, McKean excavates time as though it were a stratum of earth. Digging up layers and layers of history, each more ancient than the last, he amasses a singular mound of mythologies and realities. This new totality, at once foreign and viscerally known, seeps through the space of the Hutzler Brothers Palace Building and unsettles any illusion of a static physical site. Michael Jones McKean’s The Ground continues at the Hutzler Brothers Palace Building (200 North Howard Street, Baltimore) through May 19. The project will remain on view by appointment only through May 31.